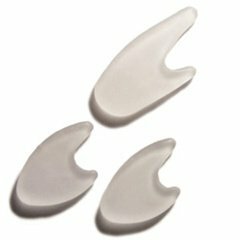 Gel Toe Separators Anatomically designed to fit comfortably between toes Relieves pressure and friction between toes Helps correct overlapping toes Packaged in a polybag Reduce friction and irritation between toes with moisturizing Gel Toe Separators. Helps relieve pain of soft corns, overlapping toes, nail problems and bunions. Gel separators comfortably fit between toes to absorb pressure. Gel will not flatten or lose its shape like foam and other low cost/low performance products. Product is washable and reusable. If you have any questions about this product by The Silipos Incorporated, contact us by completing and submitting the form below. If you are looking for a specif part number, please include it with your message.